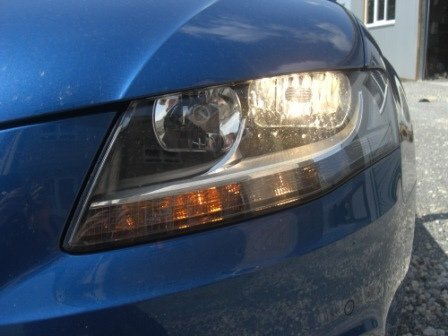 By Jason Imms on Sept. 6, 2011 at 2:50 p.m.
Did you know that car companies are starting to use lasers in headlights? 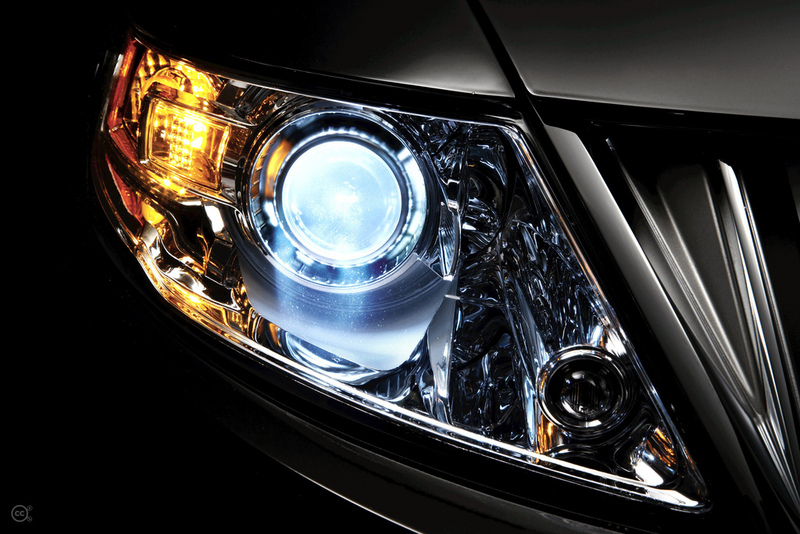 There’s a surprisingly long and storied history behind the evolution of headlight design. Numerous engineering challenges cause delays in the introduction of newer technologies, despite their outwardly obvious advantages. These challenges are increasingly being overcome by intrepid automotive electrical engineers, meaning that a number of different types of headlights are in regular use on our roads. Let’s take a look at each of these technologies and learn how to identify them as they blind us in our rear-view mirrors. The most common headlamps in production make use of Tungsten filaments contained in an inert gas with small amounts of halogen, such as iodine or bromine. The halogen stops the tungsten filament from blackening the glass of the headlamp meaning that the optimal lumens-per-watt ratio is achieved for the entirety of the life of the headlamp. Tungsten Halogen headlamps give off a light with a warm yellow hue. HID (High Intensity Discharge) headlamps vaporise metallic salts within an arc chamber containing xenon gas, creating the high intensity electrical arc for which the technology is named. The light from this electrical arc is reflected to provide forward illumination for the vehicle, and is more efficiently generated than the light produced by Tungsten Halogen headlamps. 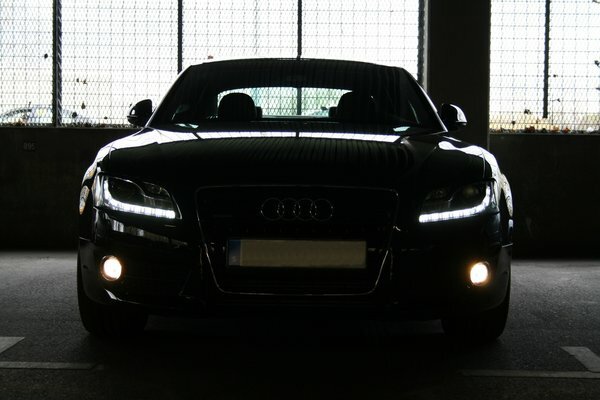 HID headlamps have been in production since 1991, and are subsequently in fairly common circulation in higher-end vehicles, despite complaints from other drivers about the glare they produce. 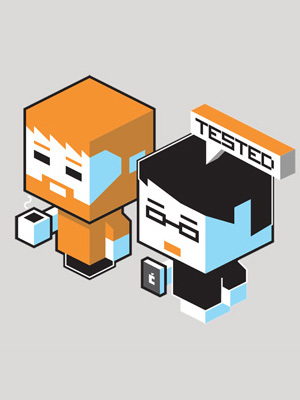 They can be identified by their (arguably distracting) cool blue tinge. Easily identifiable as strips or rings of smaller light sources in place of a single large light source, LEDs provide the lowest energy consumption, longest lifespan, and most flexible design possibilities when compared to other light sources. As the technology evolves, it is predicted that LEDs will eventually out-perform HID headlamps. Unfortunately, high production costs and engineering challenges around heat dissipation currently prevent LEDs from taking the pole market position. White LEDs give off a much colder light than that of Tungsten Halogen globes, without being quite as blue as HID. 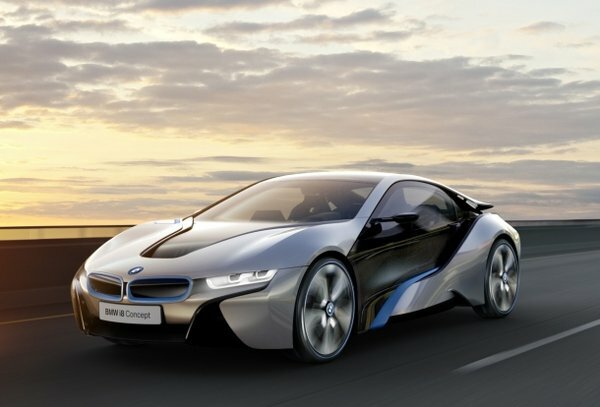 BMW is currently developing technology that will allow them to mount lasers to the front of their upcoming i8 Hybrid. Disappointingly enough, these lasers aren’t designed to allow drivers to destroy slow moving traffic, rather they will perform the far more mundane function of illuminating the road ahead of the vehicle. Laser headlamps are made safe by being filtered through a fluorescent phosphor material, which changes the color from blue to white and serves to eliminate any harmful effects. The primary benefit of using lasers in place of other types of headlamps is their energy efficiency. Lasers generate 170 lumens per watt, while LEDs generate only 100 lumens per watt meaning that battery strain in electric cars sporting laser headlights would be significantly reduced. They would also allow for computer controlled lighting patterns for differing conditions, thanks to the fact that lasers give off a coherent beam, removing the necessity to have different light configurations for high beam, side illumination and forward illumination. Laser headlights could also mean a considerable shift in car design, as the 10 micron laser diodes don’t require as much space as their 1 millimeter-square LED counterparts. 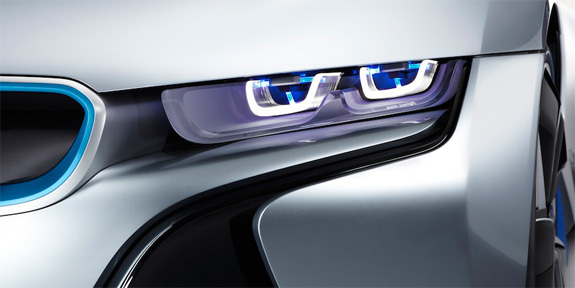 BMW has no plans at this stage to reduce the surface area of car headlights as they are an important styling cue. This, however, doesn’t mean that the forward sections of cars in the future won’t employ radically different headlight design, or even eschew them altogether in favor of a row of laser diodes hidden amongst the grille or under the hood. Image credits: Flickr user jandersen_dk, Ford Motor Company, and BMW.